I've commented here before about how requests to assist Mandy with one of her crafts are never as easy as she imagines. For instance, earlier today she decided she wanted to make a wooden box out of old lumber for her future Valentines's creation. She came out of the garage holding a board and asked, "can you make this into a box for me? Should be just a could of cuts and a few screws." She offered to draw a picture for me to explain her idea, but I took the pen and drew it for her (some things are too painful to witness). While making a wooden box sounds innocent enough, I knew that it would take an hour once the cars were moved out of the garage, the saws were pulled out, the compressor set up, the boards cut, the edges routered, the box nailed together, the glue dried, the sawdust vacuumed...you get the picture. Of course, I was trying to stay on Mandy's good side for reasons of my own (what guy wants to be the Valentine's day Scrooge? Ba-humbug and you're cuddling by yourself), so I ambled out to the garage and glanced around to see if I could somehow pull of her project without getting covered in sawdust. My eyes moved around my shop, looking for the easy way out, and finding it. When we'd purchased our last house from the original owner, who'd built it in the 50's, I'd inherited his old shop. It had been mostly cleared out, but had a half dozen small wooden boxes that held miscellaneous hardware, manly stuff that you might never need but couldn't bear to throw away. I'd taken the boxes with me when we moved, and now I knew why. I grabbed an empty toothbrush box and oatmeal container from the recycling bin, transferred the hardware, and presented Mandy with her wooden boxes, contingent of course on the promise that they'd be returned to their rightful purpose of holding hardware once Valentine's Day was over. 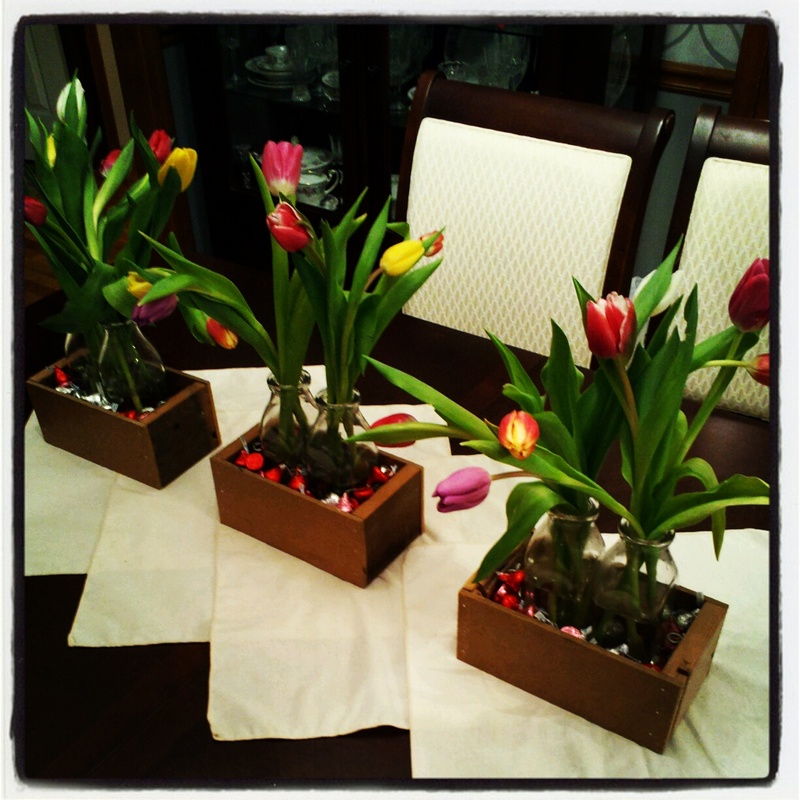 A few womanly touches and, voila, my manly boxes were the centerpiece of a lovely tulip and chocolate montage. I'm sure Mandy will post about it in the near future. But don't expect such crafting genius to come forth from me naturally. I only crafty out of self defense. That was genius though! Way to save on some work!! !